Norman Rockwell, United Nations, 1953. Unpublished study. Graphite and charcoal on paper, 27¼ × 73½ in. (69.2 × 186.7 cm). Norman Rockwell Museum, Stockbridge, Massachusetts. United Nations by Norman Rockwell, an American illustrator, is colorless and drawn only with shades of grey because it went unpublished. Nevertheless, the illustration was meant to be a mural and is drawn on a long, but not tall, canvas with graphite and charcoal. In the foreground of the piece there are three men dressed formally and the respective nations, the USSR, United Kingdom and the United States, they represent written on plaques in front of them, facing the viewer. The man seated in the far left, from the USSR, has a slight smirk on his face while he listens to the man representing the United States speak. In the background of the illustration Rockwell drew an extremely diverse group of people, unlike a majority of his works which exclusively contain white subjects. Not only are there men and women of different races but they represent different religions, ages, and occupations which starkly contrasts with the uniformity of the three men in front. Many of the people in the back have their hands clasped near their chests or mouths and all of the people are looking onto the three men with a somewhat hopeful expressions on their faces. The people are grouped behind the United Nations’ flag: a world map enclosed by two olive branches. The three men, however, have their backs turned to the people as if they do not even recognize they are there setting up an interesting dichotomy between the two groups of people pictured. This illustration is set in the United Nations Security Council in 1953. The United Nations was founded by 51 countries following World War II in 1945. However, the roots of the creation of the United Nations can be traced back even further and is very much connected to the Four Freedoms that Franklin Delano Roosevelt outlined in January of 1941. In August of 1941, a few months after Roosevelt’s Four Freedoms Speech, the Atlantic Charter was created by Roosevelt and Winston Churchill, Prime Minister of the United Kingdom of Great Britain and Northern Ireland at the time. The charter contains many of the same ideals of the Four Freedoms and was the basis for the formation of an international organization in which nations would work collaboratively in hopes of a better world post World War II. Later, in 1942, the Declaration of the United Nations was signed by 26 countries affirming their commitment to the proposals in the Atlantic Charter. Finally, in 1945 at the San Francisco Conference 46 countries agreed that international collaboration to secure the Four Freedoms globally was necessary and agreed upon the Charter of the United Nations. Once all the countries were united it was up to them to hold each other accountable in safeguarding human dignity. While the United Nations does not take any punitive measures, many of the standards that were set concerned the basic rights that should be afforded to everyone which included, but was not limited to, the Four Freedoms – freedom of speech and worship and freedom from want and fear. Since its inception, the United Nations has been committed to establishing and maintaining the Four Freedoms abroad. One of the many roles the United Nations holds is to resolve international conflicts in order to maintain a peaceful world order. The United Nations was put through its first major test in 1950 with the beginning of the Korean War. 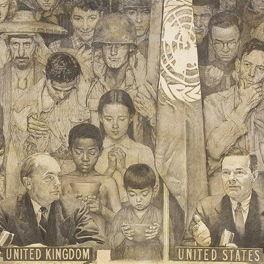 During the mural’s creation in 1953, the war was at its height, and it was up to the United Nations to prove it had the ability to meet its mission. While they were allied throughout World War II, the Soviet Union and the United States now backed opposing forces in Korea marking the first conflict of the Cold War. It was unheard of at the time for warring countries to be engaged in discourse. However, Rockwell himself photographed the scene of the ambassadors talking in the Security Council. The people in the back of the mural look at the ambassadors with a sense of desperation as the three countries discuss what steps will be taken next, impacting communities across the globe. Nonetheless, the Security Council proved to be ineffective at bringing the war to a close. Instead of discussing strategies to end of the war, the United States and the Soviet Union used the United Nations as a way to debate which of their ideologies was superior. Interestingly, Rockwell chose to depict the Security Council instead of any of the six organs of the United Nations. All three of the countries represented are permanent members of the United Nations and along with France and China have the power to veto anything in the Security Council. One can only imagine how ineffective this becomes, especially when two of the countries with the veto power are at war. Any proposals put forward did not sit well with either the United States or the Soviet Union and neither was willing to make concessions. Rockwell may have been trying to expose the ineffectiveness of the United Nations at the time with the artistic decisions he made. All three ambassadors have their backs turned to the people behind them as if they are unaware they exist. Though there are battle hardened soldiers and children with empty bowls looking on to the ambassadors pleading for change, the ambassadors had no incentives to make compromises and end the war. It is unknown as to whether Rockwell’s intention in creating this piece was to expose some of the faults of the United Nations. On the other hand, the alternative to the United Nations, no United Nations, would be disastrous for foreign relations. While the United Nations may have failed in this instance, they are a pivotal organization in maintaining collaboration and continuing the fight to preserve the Four Freedoms internationally. Gardner, Richard N. “The Soviet Union and the United Nations.” Law and Contemporary Problems 29, no. 4 (1964): 845-57. https://w.ww.jstor.org/stable/1190697. Goodrich, Leland M. “The United Nations and the Korean War: A Case Study.” Proceedings of the Academy of Political Science 25, no. 2 (1953): 90-104. https://www.jstor.org/stable/1173269. Liskofsky, Sidney. “UNITED NATIONS.” The American Jewish Year Book 52 (1951): 437-49. http://www.jstor.org/stable/23604673. Lowe, Vaughan V., Adam Roberts, Jennifer M. Welsh, and Dominik Zaum. The United Nations Security Council and War: The Evolution of Thought and Practice since 1945. Oxford: Oxford University Press, 2010. Norman Rockwell Museum. “We the Peoples: Norman Rockwell’s United Nations.” Accessed July 10 2018. https://www.nrm.org/2016/06/peoples-norman-rockwells-united-nations-2/. Petrick, Jane Allen. Hidden in Plain Sight: The Other People in Norman Rockwell’s America. Miami, FL: Informed Decisions Publishing, 2013. United Nations, “Charter of the United Nations,” San Francisco, 1945. https://treaties.un.org/doc/publication/ctc/uncharter.pdf. United Nations. “History of the UN Charter.” Accessed July 10 2018. http://www.un.org/en/sections/history-united-nations-charter/index.html.